Wright, Fiona. “Palestine, My Love: The Ethico-Politics of Love and Mourning in Jewish Israeli Solidarity Activism.” American Ethnologist 43.1 (2016): 130-43. Jewish Israeli left-wing activists engage in a subversive affective politics when they express love for, and mourn the loss of, Palestinian life. But the affects of love and mourning also bind these solidarity activists to Israeli state violence and sovereignty in various ways, entangling them in the very forms of power they aim to challenge. Loving and mourning the Palestinian Other involves an ambivalent ethics in which the activist subject objectifies the Other, and this objectification is a kind of violence that emerges in the affective becomings of solidarity activism. Activist loving and mourning thus call into question the nature of solidarity and alert us to the difficulty of ethics as troubled relations enmeshed in the violence of politics. Golan, Oren, and Nurit Stadler. “Building the Sacred Community Online: The Dual Use of the Internet by Chabad.” Media, Culture & Society (early view; online first). Religious communities have ongoing concerns about Internet use, as it intensifies the clash between tradition and modernity, a clash often found in traditionally inclined societies. Nevertheless, as websites become more useful and widely accessible, religious and communal stakeholders have continuously worked at building and promoting them. This study focuses on Chabad, a Jewish ultra-Orthodox movement, and follows webmasters of three key websites to uncover how they distribute religious knowledge over the Internet. Through an ethnographic approach that included interviews with over 30 webmasters, discussions with key informants, and observations of the websites themselves, the study uncovered webmaster’s strategies to foster solidarity within their community, on one hand, while also proselytizing their outlook on Judaism, on the other. Hence, the study sheds light on how a fundamentalist society has strengthened its association with new media, thus facilitating negotiation between modernity and religious piety. Patierno, Nicole. “Palestinian Liberation Theology: Creative Resistance to Occupation.” Islam and Christian–Muslim Relations (early view; online first). The ongoing Israeli occupation of the Palestinian Territories has widely affected the Christian population in the region. This study focuses narrowly on the diminishing minority of Palestinian Christians, and how their position under occupation has led to the development of Palestinian Liberation Theology and practices of creative resistance. It begins by acknowledging the unique position of Palestinian Christians as liminal yet indigenous members of society. It then explores their complex collective identity, demonstrating how specific facets of their historic identity (i.e. denominationalism, Arabism, and political station) have been preserved, and how these inform their theological and practical responses to the changing socio-political landscape. It goes on to probe the degree of consensus around Palestinian Liberation Theology, as well as prominent manifestations of the ideology in response to occupation. Ultimately, this study finds that Palestinian Liberation Theology represents a creative and valuable contribution to the national struggle for liberation, providing a shared ideology and culturally specific blueprint for revolutionary collective action guided by plurality, nonviolence, and collaboration. Voltolini, Benedetta. Lobbying in EU Foreign Policy-Making: The Case of the Israeli-Palestinian Conflict, Routledge/UACES Contemporary European Studies. Abingdon and New York: Routledge, 2016. 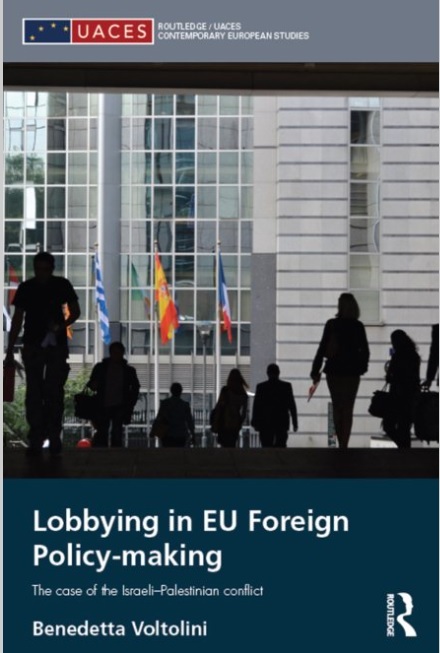 This book examines lobbying in EU foreign policy-making and the activities of non-state actors (NSAs), focusing on EU foreign policy on the Israeli-Palestinian conflict. It sheds light on the interactions between the EU and NSAs as well as the ways in which NSAs attempt to shape EU foreign policies. By analysing issues that have not yet received systematic attention in the literature, this book offers new insights into lobbying in EU foreign policy, EU relations surrounding the conflict and the EU’s broader role in the peace process. The book will be of key interest to scholars and students of political science, international relations, EU politics, EU foreign policy-making, Middle East studies and the Israeli-Palestinian conflict. 5 The Goldstone Report: To endorse or not to endorse it? 6 Framing the EU–Israel Agreement on pharmaceutical products: Cheaper medicines, territorial scope or policy coherence? Benedetta Voltolini is Lecturer in International Relations at the Department of Political Science, Maastricht University, the Netherlands. New Book: Snir, Who Needs Arab-Jewish Identity? Snir, Reuven. Who Needs Arab-Jewish Identity? Interpellation, Exclusion, and Inessential Solidarities. Leiden: Brill, 2015. In Who Needs Arab-Jewish Identity? : Interpellation, Exclusion, and Inessential Solidarities, Professor Reuven Snir, Dean of Humanities at Haifa University, presents a new approach to the study of Arab-Jewish identity and the subjectivities of Arabized Jews. Against the historical background of Arab-Jewish culture and in light of identity theory, Snir shows how the exclusion that the Arabized Jews had experienced, both in their mother countries and then in Israel, led to the fragmentation of their original identities and encouraged them to find refuge in inessential solidarities. Following double exclusion, intense globalization, and contemporary fluidity of identities, singularity, not identity, has become the major war cry among Arabized Jews during the last decade in our present liquid society. Reuven Snir is a Professor of Arabic Literature and Dean of Humanities at Haifa University. He has published many books, articles, translations, and encyclopedia entries. His latest book is Baghdad – The City in Verse (Harvard University Press, 2013). New Article: Snir, Who Needs Arab-Jewish Identity? Snir, Reuven. “Who Needs Arab-Jewish Identity? Fragmented Consciousness, ‘Inessential Solidarity,’ and the ‘Coming Community’ (Part 2).” Journal of Modern Jewish Studies 14.2 (2015): 299-314. This is the answer to the question posed in the title of the present article, there is now no necessity for Arab-Jewish identity, simply because there is no need in our contemporary fluid societies for the traditional notion of identity. The processes which the Arabized Jews and their offspring have undergone are not exclusive. Against the background of the fluidity of identities and globalization at the beginning of the twenty-first century, I believe that the traditional notion of identity has gradually been wearing off. This by no means implies that there are no significant differences between the elite—that is, the intellectuals whose subjectivities are the main subject of my research project and who are intensely affected by the global tendency towards inessential solidarities—and other segments of society whose members are more liable to adhere to the traditional notions of identity. First, unlike the irreconcilable gap, in my view, between the radical “Mizrahi” post-Zionist elite and the masses, the above tendency may be considered to be a vanguard in the sense that it is expected to precipitate a similar large-scale tendency in these masses, even if in this stage it is still far removed, politically, socially and mentally, from it. The recent revolutions in the Arab world have proved inspirational to many because they offer a new sense of collective identity built on the idea of citizenship and not on any essential solidarity such as clan, religion, race or ethnicity. Second, global phenomena such as mass migration and the Internet, which are no longer limited to the elites, have broadened those segments in society that are influenced by the universal inclination towards inessential solidarities. Singularity, not identity, is now the major war cry in our contemporary fluid societies. Naor, Moshe. “Israeli Mobilization and the Overseas Volunteers in the Six-Day-War.” Journal of Modern Jewish Studies 13.3 (2014): 442-58. This article examines the mobilization of the Israeli home front and the overseas volunteering movement that began in May 1967 and continued through the summer of 1968. The mobilization in the Six-Day War included manifestations of solidarity and volunteering in diverse fields. The Israeli government and the Histadrut sent volunteers to frontier communities and raised funds from the public to finance the war. The movement included World Jewry, which also participated in fundraising through an emergency campaign and sent thousands of volunteers to Israel. The goal of the Israeli government and the Jewish Agency to transform the volunteering movement into a Jewish immigration movement to Israel and to strengthen the bond between Israel and World Jewry, shaped the character of this movement. The article examines the character of this movement and discusses the nature of the encounter between the overseas volunteers and Israeli society. Schulman, Sarah. Israel/Palestine and the Queer International. Durham, NC: Duke University Press, 2012. Prashad, Vijay. “Putting Palestine on the Map.” Jadaliyya, November 9, 2012. Bianco, Marcie. “Review.” Lambda Literary, November 27, 2012. Kearns, Gerry. “Gender, Politics, Solidarity.” Dublin Review of Books. Clifton, Lois. “Review.” Socialist Review, January 2013. Kerr, Ted. “Sarah Schulman’s Joy and the Queer Practice of Everyday Freedom.” Pretty Queer, February 14, 2013. Jochnowitz, George. “Pinkwashing is Hogwash When Used Against Israel.” Arutz Sheva, April 5, 2013. Somerson, Wendy Elishheva. “Queering Palestinian Solidarity Work.” Tikkun, July 28, 2013. Irmas, Jack. “Limited Solidarity with Palestine in Schulman’s Queer International.” Electronic Intifada, July 31, 2013. Atzmon, Gilad. “Review.” Veterans Today, August 7, 2013. Roffman, Eleanor. “Exposing Pinkwashing.” Women’s Review of Books, September/October 2013. Gorshein, David. “Review.” Journal of Modern Jewish Studies 13.2 (2014): 313-315. Preser, Ruth and Chen Misgav. “Review.” Journal of Middle East Women’s Studies 11.1 (2015): 111-3. Dina Matar (author), Zahera Harb (author), eds. Narrating Conflict in the Middle East: Discourse, Image and Communications Practices in Lebanon and Palestine. London: Tauris, 2013. Palestine and they respond dynamically to these realities.